Youthful adventures began. 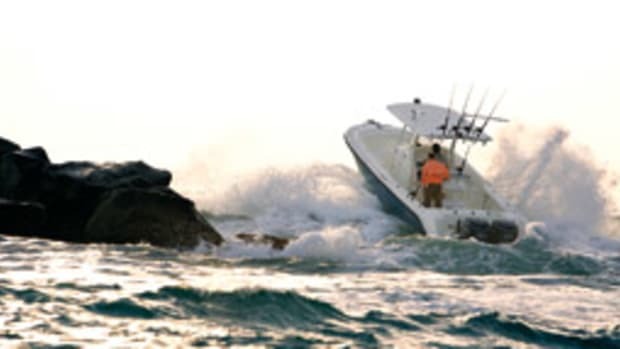 More boats followed: a 21-foot Formula, his “go-fast boat”; a 17-foot Whaler that went “everywhere and anywhere you could go, at all times of the day and night”; a 1980 Boston Whaler Outrage (which he still owns). In short, he used the heck out of them. Then came his “Bertram project,” during which Baker got a taste for fixing boats, for customizing them as he went along. “I was in my early 30s, and I thought I’d like to own something that is a classic, something quality, a boat that means something,” he says. 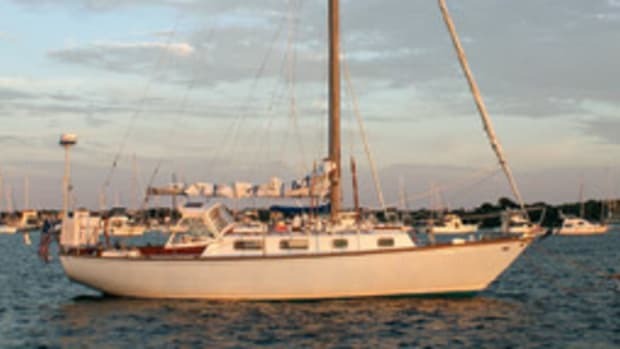 He found a 1970 25-foot Bertram Open and spent a year restoring it. After that, Baker says, he was excited about future possibilities. The idea was to do something a little different, something unique with a boat that had good bones. Jon Baker at the helm of his refurbished boat. 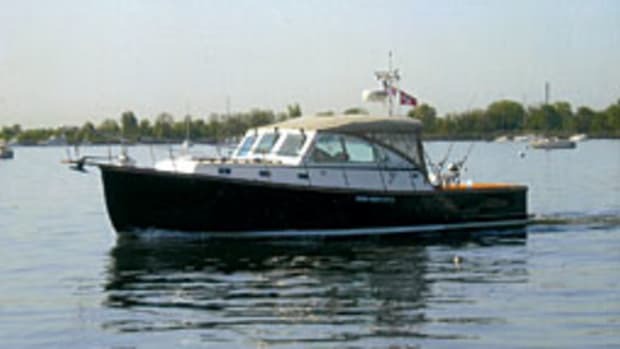 The boat he chose was a 2010 Regulator 34SS, which he bought in 2011. Powered with twin Yamaha 350s, its price was $220,000. 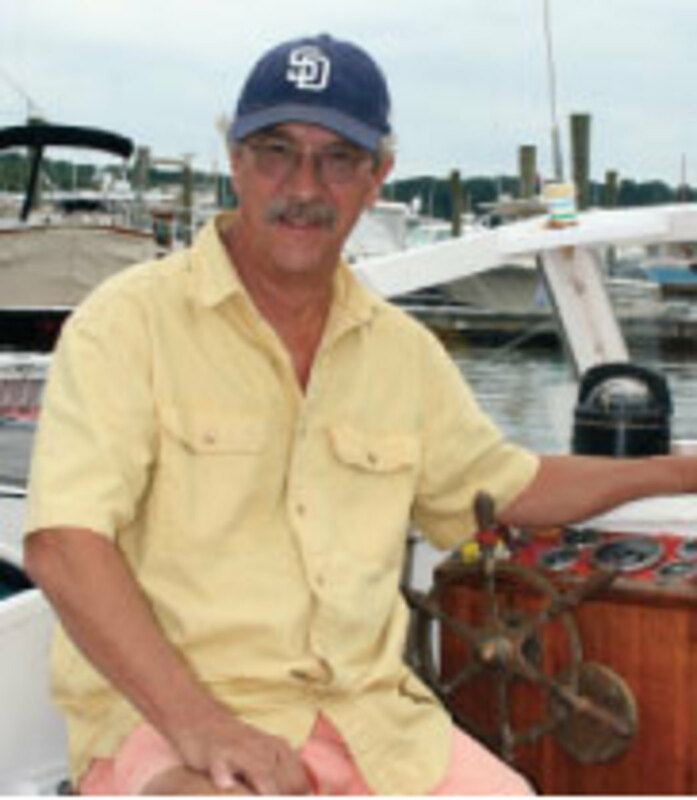 His boat, Piece Of Cape, was also well suited to the project he envisioned: a major repower. That’s not quite what happened. During his research, Baker came across Seven Marine, the Germantown, Wisconsin, maker of premium outboard motors. 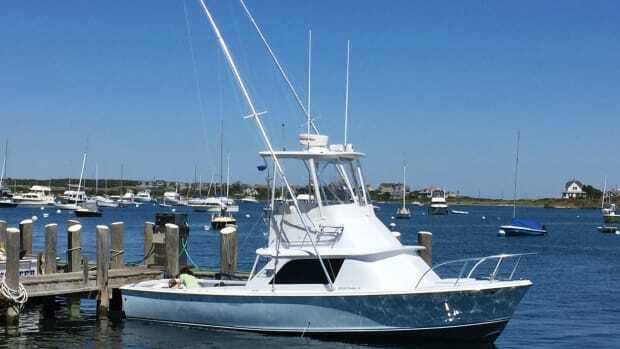 Now, his Regulator 34 is powered by a pair of Seven Marine 627s, installed by MacDougalls’ Cape Cod Marine Service of Falmouth, Massachusetts. Each 376-cubic-inch, small-block V-8 powerplant develops 627 horsepower at 5,600 rpm, according to the spec sheets. Weighing around 1,200 pounds, the super-charged, all-aluminum outboard has multiport injection, closed-loop cooling and a compression ratio of 8.6:1. Boat and motor have turned out to be a winning combination, Baker says, delivering the performance he was seeking. The boat used to run wide open with twin Yamaha 350s at 5,800 rpm at 52 mph; it now cruises at 52 mph and has a top speed of 74 mph with the 627s. Putting new engines on the back was just the start of his Regulator project. The result is a 2010 Regulator that, during the past four years, has been made into a 2018 Regulator with a Macris Industries underwater lighting package and LED lighting on the engines. New electronics are in a customized helm station with new seats, along with new cushions for the forward seating. “If it wasn’t bolted down, it’s been replaced, updated or made new,” Baker says. Baker does some fishing too, so outriggers were added. 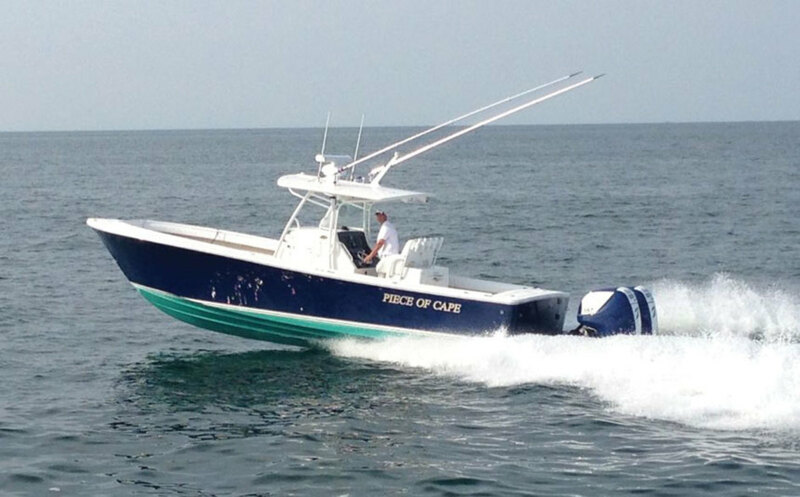 The North Carolina-built boat rides a deep-vee hull with 24 degrees of deadrise aft. 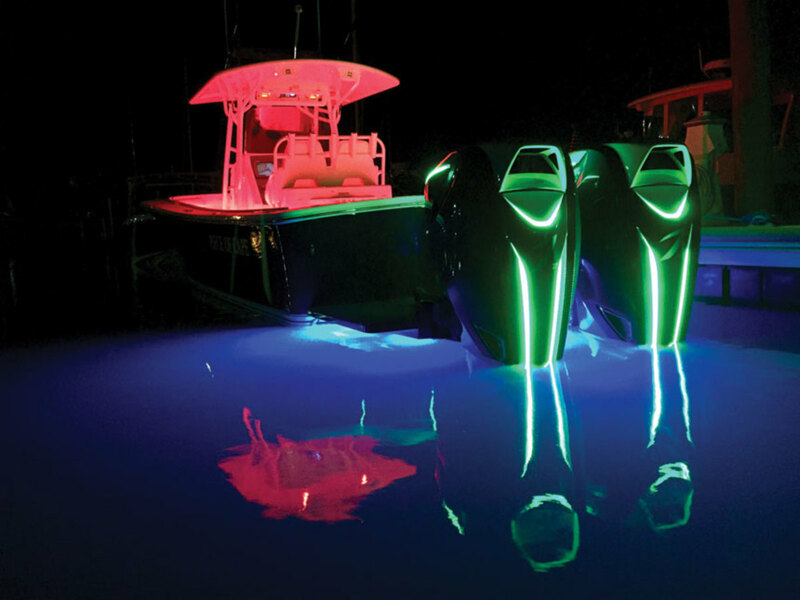 Twin 350-hp Yamaha outboards are standard, delivering a top speed of 40 to 45 mph. 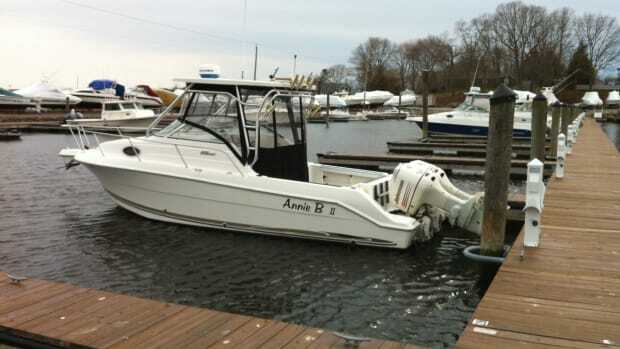 An Armstrong engine bracket is standard, and the transom was updated in 2014 to handle triple 350s. The console helm station has twin seats and a dash to accommodate large-screen displays. Inside the console is a stand-up head with a sink and a shower, along with a berth. 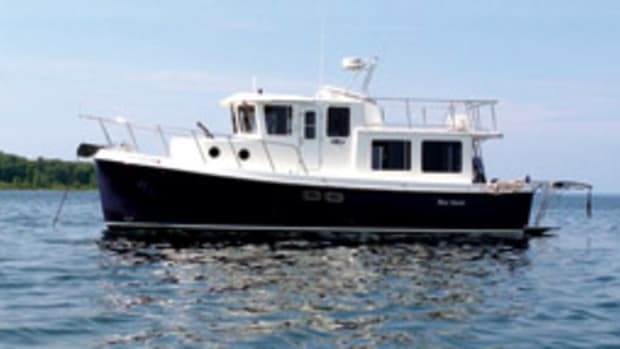 Fishing gear includes a 25-gallon transom live well, a leaning post/tackle center with a live well and rod holders, a transom fish box, an in-sole fish box, and fresh- and raw-water washdowns. There are a transom door and a transom shower. Seating includes a C-shaped lounge forward (with stowage underneath) and a console seat with a cooler. 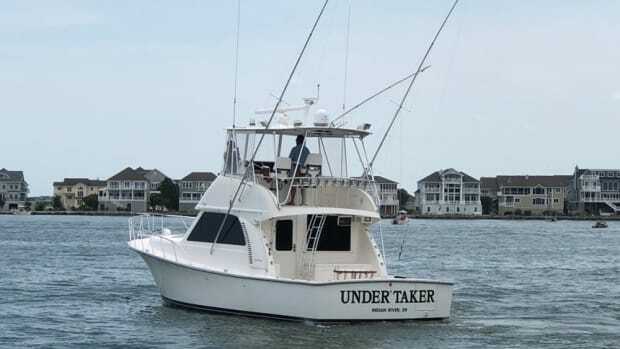 Options include a fiberglass T-top and a radio box, along with outriggers and spray curtains. Life doesn’t stay the same. Boats don’t, either.